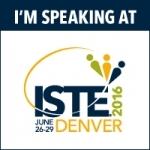 I am so pleased to be presenting at the International Society for Technology in Education (ISTE) Conference in Denver this June. My presentations are up and registrations are happening – click the link to register, and join in my creative, hands on workshops with iPads. I am also humbled to be receiving the ISTE Mobile Learning Innovation Award at a ceremony during the conference.